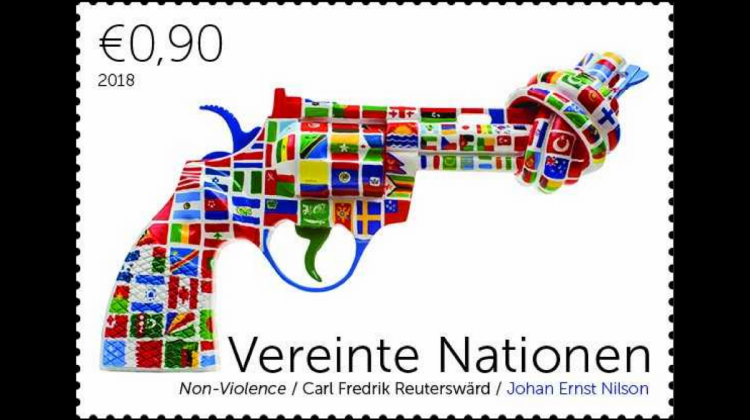 In recognition of this year’s International Day of Non-Violence, the United Nations Postal Administration is issuing three new definitive stamps featuring images of the Knotted Gun sculpture, officially known as the Non-Violence sculpture. The General Assembly, in June 2007, decided to observe the International Day of Non-Violence on 2 October, which is also the birthday of Mahatma Gandhi, leader of the Indian independence movement and pioneer of the philosophy and strategy of non-violence. The day reaffirms “the universal relevance of the principle of non-violence” and the desire “to secure a culture of peace, tolerance, understanding, and non-violence”. The Non-Violence sculpture was created in 1980 by the Swedish artist Carl Fredrik Reuterswärd as a tribute to John Lennon. It has become a symbol for peace and non-violence, with more than 30 sculptures placed in strategic locations worldwide, including the UN Headquarters in New York, the Olympic Museum in Lausanne, and the Peace Park in Beijing. The artwork for the 1¢ definitive stamp is an engraving by Martin Mörck of Norway. 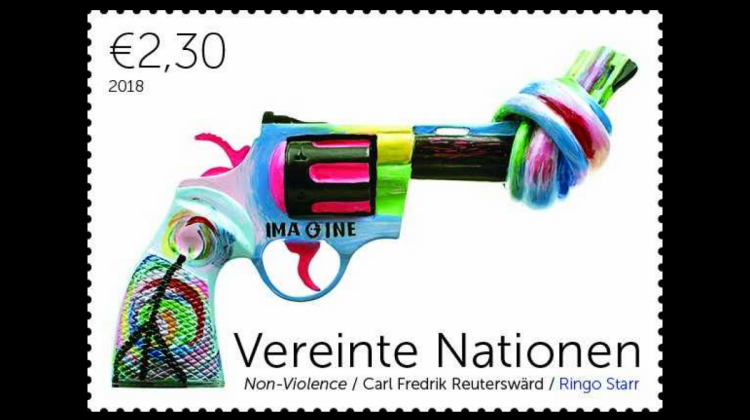 The € 0,90 and € 2,30 definitive stamps are painted knotted gun sculptures which are part of the Non-Violence Art Project. The € 0,90 stamp features artwork by Swedish environmental explorer, Johan Ernst Nilson, who will be at UN Headquarters to unveil these stamps on 2 October 2018. The € 2,30 stamp features artwork by English musician, song writer and actor, Ringo Starr of the band The Beatles. The Non-Violence sculpture is used as a symbol by the Non-Violence Project Foundation, a non-profit organization promoting peace and social change through education, to inspire, motivate and engage young people to understand how to solve conflicts peacefully. To purchase these stamps, as well as other UNPA products, please visit unstamps.org. 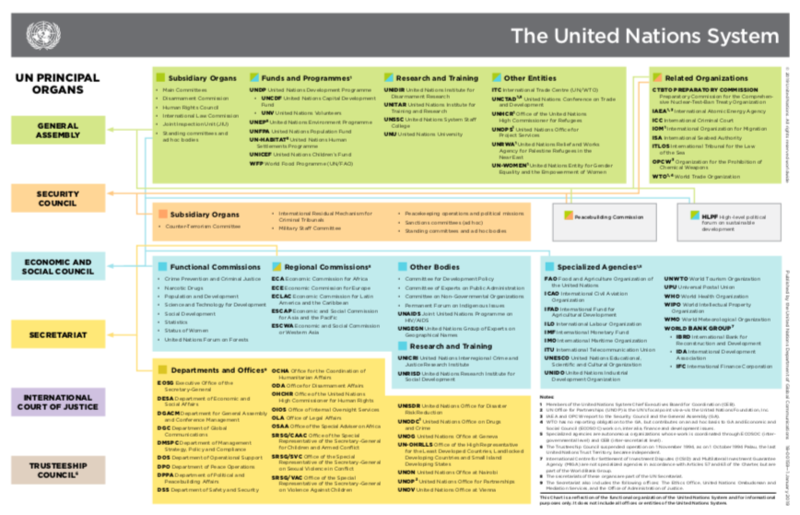 You can also visit the UNPA stamp shops in New York, Geneva and Vienna. Follow UNPA on Facebook, Twitter and Instagram.